PIERRO Leading 3YO Male on the 2013 WTR (Sprint). Champion 2YO in Australia in 2011-12. 11 wins-6 at 2-from 1000m to 1600m, A$4,536,650, ATC Golden Slipper S., Gr.1, Sires' Produce S., Gr.1, Champagne S., Gr.1, George Ryder S., Gr.1, Canterbury S., Gr.1, Todman S., Gr.2, Hobartville S., Gr.2, Silver Slipper S., Gr.2, MVRC Bill Stutt S., Gr.2, ATC Run to the Rose H., Gr.3, Breeders' P., L, 2d ATC Doncaster H., Gr.1, MRC Caulfield Guineas, Gr.1, 3d MVRC WS Cox P., Gr.1. He entered stud in Aust. in 2013. Leading Aust. First Season Sire in 2016-17. Sire of 234 progeny to race, 137 winners (58.0%), earnings of over $21 million, 16 stakes winners, 11 stakes placegetters, inc.
PIERATA (14c, Flying Spur, Zabeel). 7 wins-1 at 2-to 1400m to 2018-19, A$3,311,300, ATC All Aged S., Gr.1, Missile S., Gr.2, Sydney S., Gr.3, BRC Vo Rogue P., Gr.3, GCTC Magic Millions Guineas, RL, ATC Light Horse Brigade 2YO P., BRC Insulation Winning Rupert P., 2d ATC Randwick Guineas, Gr.1, Galaxy H., Gr.1, Hobartville S., Gr.2, Bill Ritchie H., Gr.3, BRC Gold Edition P., L, 3d VRC Sprint Classic, Gr.1, BRC Sires' Produce S., Gr.2. ARCADIA QUEEN (15f, Redoute's Choice, Metal Storm). 5 wins from 1200m to 1800m in 2018-19, A$1,093,435, Perth Racing Kingston Town Classic, Gr.1, Western Australian Guineas, Gr.2, WATC Champion Fillies S., Gr.3, Arlec H., Tabtouch Better Your Bet P., 3d WATC Burgess Queen S., L.
LEVENDI (14c, Redoute's Choice, Thunder Gulch). 5 wins-1 at 2-from 1200m to 2400m to 2017-18, A$1,653,950, ATC Australian Derby, Gr.1, Tulloch S., Gr.2, VRC Carbine Club S., Gr.3, MRC (Mornington) Fastrac Foodservice H., 2d MVRC Alister Clark S., Gr.2. PINOT (14f, Zabeel, Danehill). 3 wins from 1800m to 2500m in 2017-18, A$733,275, VRC Oaks, Gr.1, MRC Ethereal S., Gr.3, VRC Kennedy Oaks Trial P.
REGAL POWER (15g, Redoute's Choice, Metal Storm). 4 wins from 1300m to 2400m in 2018-19, A$474,970, Perth Racing Western Australian Derby, Gr.2, Melvista S., L, Lex Piper S., L, WATC Furphy P., 2d Perth Racing JC Roberts S., L, Challenge S., L, 3d Perth Racing Sir Ernest Lee-Steere, L, Bunbury TC Rangeview Stud Classic, L.
ACTION (14g, Redoute's Choice, Metal Storm). 3 wins from 1300m to 2400m in 2017-18, A$519,200, Western Australian Derby, Gr.2, WATC Tabtouch P., 2d Perth Cup, Gr.2, WATC Asian Beau S., Gr.3, Perth Racing ATA S., L, WATC Lex Piper S., L, Bunbury TC In Memory of B Ballantyn H., 3d WATC Penfolds H., Ascend Sales Trophies H.
TULIP (14f, Rock of Gibraltar, Bering). 4 wins-2 at 2-to 1400m to 2018-19, A$1,049,875, ATC Magic Night S., Gr.3, MVRC Typhoon Tracy S., Gr.3, 1print 2YO P., MRC Punters Living Legends H., 2d MRC Blue Diamond Preview (f), Gr.3, MVRC Johnnie Walker P., Ladbrokes Back Yourself H., 3d ATC Golden Slipper S., Gr.1, 4th MRC Blue Diamond S., Gr.1, ATC Tea Rose S., Gr.2, VRC Blazer S., Gr.2, MRC Kevin Hayes S., Gr.3. ARCADIA PRINCE (14g, Redoute's Choice, Metal Storm). 7 wins to 1400m to 2018-19, A$460,275, Perth Racing AJ Scahill S., Gr.3, WATC Crown Sports Bar P., Peninsula Dining Room H., Tabtouch-Better Your Bet H., RTG H., Perth Racing Crown Towers H., 2d WATC Minearc Systems H., Rentokil Initial H., Awesome Rock 2YO P., 4th WATC Fairetha S., L.
BELLEVUE HILL (16c, Exceed and Excel, Zeditave). 2 wins at 2 in 2018-19, A$168,200, ATC Schweppervescence H., Gr.3, 2d ATC Todman S., Gr.2. FURORE (14g, Redoute's Choice, Nureyev). 6 wins from 1250m to 2100m to 2018-19, A$155,930, HK$17,934,250, HKJC BMW Hong Kong Derby, L, Hong Kong Classic Mile, L, 3d ATC Rosehill Guineas, Gr.1, HKJC Lung Kong H., 4th Hong Kong Classic Cup, L.
ROY HAD ENOUGH (14c, Elusive Quality, Danehill). 5 wins-2 at 2-at 1600m, 1900m to 2017-18, R604,094, Greyville Christmas H., L, Darley Arabian, L, Silverline Panel Beating and Spray Painting S., Winningedgepresentations.co.au Juvenile P., 2d Greyville Michaelmas H., L, Itsarush.co.za H., 3d Greyville Gold Circle Racing You Tube Channel Playlist H., 4th Greyville Christmas H., L.
OCTABELLO (14g, Secret Savings, Rubiton). 4 wins-1 at 2-from 1300m to 2050m to 2018-19, A$311,750, Cranbourne Cup, L, VRC Rose of May H., 2d MRC Le Pine Funerals H., 3d MRC Inglis Cup. KENTUCKY BREEZE (14g, Redoute's Choice, Citidancer). 3 wins from 1100m to 1600m to 2018-19, A$173,300, VRC Emirates Airline H., L, Ballarat TC Suez McKellar Mile H., 2d VRC Employee Volunteer H.
I LIKE IT EASY (15f, General Nediym, Flying Spur). 2 wins-1 at 2-at 1200m, 1400m to 2018-19, A$151,845, ATC Reginald Allen H., L, Tab.com.au 2YO P., 2d ATC Sledmere Stud 2YO H.
COMMANDER (15g, More Than Ready, Touch Gold). Winner at 2 in 2017-18, SCTC The Phoenix S., L, 2d ATC Pluck at Vinery 2YO H.
SATIN SLIPPER (15f, Flying Spur, Volksraad). Winner at 2 in 2017-18, A$130,000, ATC Gimcrack S., L, 2d ATC Lonhro P., L.
Poseidon's Pool - Luen on Poseidon (Mac.) (14g, Exceed and Excel, Bellotto). 3 wins-2 at 2-to 1200m to 2017-18, A$99,000, M$3,500, SAJC Medallion Homes 2YO H., 3d MRC Vain S., Gr.3. Aeecee Tong De (14f, Elusive Quality, Dayjur). 2 wins at 1100m, 1200m to 2018-19, A$132,230, ATC Book Summer Hospitality H., MRC (Mornington) Play Rosebud Country Club H., 2d MVRC Ladbrokes VOBIS Gold Carat, 3d MRC Summoned S., Gr.3, MVRC Pedders Suspension H.
Sikorsky (15c, Rock of Gibraltar, Bering). Winner at 1600m in 2018-19, A$164,870, 2d VRC UCI S., L, 3d MRC Caulfield Classic, Gr.3, 4th VRC Victoria Derby, Gr.1. Femme Fireball (14f, Fastnet Rock, Peintre Celebre). 6 wins at 1200m, 1350m to 2018-19, A$194,150, GCTC Magic Millions H., BRC Sky Racing Pam O'Neill H., Orthochick H., Westwood Workshop H., Konami Ubet Jockey Series P., 3d BRC Just Now H., L.
Holbien (14g, Danehill Dancer, Royal Academy). 4 wins to 1450m to 2018-19, A$232,260, VRC St Vincent's Hospital H., MRC Blue Star Print Group H., 2d VRC Chester Manifold S., L, Bendigo Guineas, L, 3d VRC MSS Security Sprint H., L, MRC Nitto Denko H., MVRC Simpson Construction P., 4th VRC Standish H., Gr.3. Rainbow Girl (15f, Fastnet Rock, Rubiton). 2 wins at 1000m in 2018-19, 2d MVRC William Crockett S., L.
True Magic (15f, Redoute's Choice, Midyan). Winner at 1200m in 2018-19, 3d TRC Strutt S., L.
Rome (16c, Exceed and Excel, Stravinsky). Placed at 2 in 2018-19, A$104,100, 2d BRC BJ McLachlan S., Gr.3, Canberra RC Black Opal S., Gr.3, 4th ATC Breeders' P., Gr.3. Rendition (16f, Lion Hunter, Last Tycoon). Placed at 2 in 2018-19, 2d ARC 100% Appliances 2YO H., 3d ARC Champagne S., L.
Canyonero (15g, Danehill, Sadler's Wells). 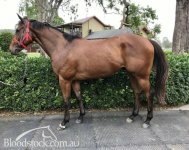 Placed at 2 & 3 to 2018-19, A$102,970, 2d ATC Unconquered Sprint 2YO H., Cabra-Vale Diggers P., 3d ATC Inglis Nursery, RL, Abercorn Hall of Fame 2YO H.
Princess Pierro (15f, Exceed and Excel, Woodman). Placed at 2 & 3 to 2018-19, 2d WATC Supremacy S., L, Belmont Horse of the Year 2YO P., Tabtouch 2YO P., Perth Racing Tabtouch Better Your Bet P., 4th WATC Gimcrack S., Gr.3. True Defender (15g, Redoute's Choice, Metal Storm). 2 wins at 1300m, 1400m in 2018-19, A$86,935, WATC Argonaut Corporate Advisers P., 2d WATC Yellowglen 2YO H.
Perfect Pitch (15f, Commands, Real Quiet). Winner at 2 in 2017-18, A$128,210, ATC Book Summer Hospitality 2YO P., 2d ATC ANZ Bloodstock News H., Star Turn at Vinery H., TAB Rewards H., 3d ATC Tab.com.au 2YO P., ANZ Bloodstock News H.
Aqua d'Ivina (14f, Danehill, Irish River). 4 wins from 1350m to 1800m to 2018-19, A$203,000, ATC Inglis Ready2Race Sale H., La Boheme Pinot Noir Rose H., Owners Benefit Card H., 2d ATC Hinchinbrook at Yarraman Park 2YO H., Theraces H., Book Summer Hospitality H.
Leading Aust. First Season Sire in 2016-17. LONHRO (AUS) (Brown 1998-Stud 2004). 26 wins-2 at 2, VRC Australian Cup, Gr.1. Champion Aust. Sire 2010-11. Sire of 1187 rnrs, 862 wnrs, 83 SW, inc. Pierro (ATC Golden Slipper S., Gr.1), The Conglomerate, Bounding, Mental, Impending, Denman, Beaded, Exosphere, Kementari, Lyre, Aristia, Benfica, Pinwheel, Heatherly, Wawail, Academus, Messene, Cardsharp, Encryption, War Heroine, Holding Gold, Isotherm, Souchez, Ghisoni, Lonhspresso, Obsequious, etc. PIERRO (c by Lonhro) 11 wins. See below. AMBIENCE (f by Street Cry (Ire)) 3 wins from 1400m to 2000m, A$707,850, VRC Wakeful S., Gr.2, ATC Dulcify H., L, 2d Australian Oaks, Gr.1, BRC Queensland Oaks, Gr.1, ATC Epona S., Gr.3, 3d VRC Oaks, Gr.1, MRC Ethereal S., Gr.3. Thunder Set (g by Reset) 7 wins from 2150m to 3200m, A$92,825, BRC Yellowglen P.
Snow White (f by Lonhro) 3 wins at 1200m, 1300m, A$120,730, ATC Cellarbrations Blacktown H., Hyland Race Colours H.
LAVEROCK (c Octagonal) Champion Older Horse in Italy in 2006 (Int.). 5 wins-1 at 2-from 1600m to 2400m, £69,600, €562,408, 150,880Dhs, Longchamp Prix d'Ispahan, Gr.1, Milan Gran Premio Jockey Club Italiano, Gr.1, Longchamp Prix de Fontainebleau, Gr.3, Lyon-Parilly Prix Andre Baboin, Gr.3, Saint-Cloud Prix Hauban, 2d Munich Grosser Dallmayr Preis, Gr.1, Newmarket Princess of Wales's S., Gr.2, Maisons-Laffitte Prix Eugene Adam, Gr.2, Nad al Sheba Gulf News Trophy, 3d Grand Prix de Saint-Cloud, Gr.1, Criterium de Saint-Cloud, Gr.1, Milan Gran Premio del Jockey Club, Gr.1, Saint-Cloud Prix Omnium II, L, Istanbul Bosphorus Cup, L, Chantilly Prix de Villebon, 4th Ascot King George VI & Queen Elizabeth S., Gr.1, Cologne Rheinland Pokal, Gr.1. Sire. Miss Right Note. 2 wins. See above. FLYING CLOUD (f Storming Home) 3 wins from 2000m to 2400m, £105,399, €89,999, Royal Ascot Ribblesdale S., Gr.2, Saint-Cloud Prix Cléopâtre, Gr.3, Longchamp Prix de Chaillot, 2d Curragh Pretty Polly S., Gr.1, 3d York Middleton S., Gr.2, Windsor Winter Hill S., Gr.3. Producer. CAPTAIN WEBB (c Storming Home) 4 wins-1 at 2-from 1m to 11f, Hamilton Glasgow S., L, 2d Nad al Sheba Range Rover Trophy, Meydan Farriers H., 3d Nad al Sheba Alhaarth S., Meydan Naaqoos H.
Candice (f Caerleon) Winner at 2, 2d Newbury John Musker Fillies S., L, 3d Doncaster May Hill S., Gr.3, Goodwood Lupe S., L, Newmarket EBF 2YO S., 4th Sandown Atalanta S., L. Producer. LADY MEYDAN (f American Post) 3 wins from 1400m to 1600m, Saint-Cloud Prix Ceres, L, 3d La Teste Prix La Sorellina, L, Deauville Prix de la Sarthe. Producer. AGATHONIA (f Street Cry) 3 wins at 2400m, 2800m, £5,433, €75,450, to 2018 in GB, France and Germany, Hoppegarten Grosser Preis der MHWK, L, Saint-Cloud Prix Phil Drake, 2d Hannover Grosser Preis der Mehl-Mülhens-Stiftung Gestüt Röttgen, Gr.3, Grosser Preis der BMW Niederlassung Hannover, L, 3d Saint-Cloud Prix Belle de Nuit, L.
KNIGHT'S TOUR (c Reset) 3 wins at 1400m, 1600m, NZ$82,125, ARC Great Northen Guineas, Gr.2, Sakhee's Secret at Karaka Mile S., 3d ARC Stella Artois 3YO Mile. Sire. SIWA LADY (f Gonski) 7 wins to 1100m, A$219,695, Oakbank S., L, MVRC Health Science Planning Consultants H., Essendon Mazda 55 Second Challenge Heat H., 3d SAJC DC McKay S., Gr.3, MRC Coates Hire H.
Diamond Oasis (g Lonhro) 7 wins-1 at 2-to 1100m, A$505,915, GCTC Bat Out of Hell H., 2d ATC Heritage S., L, 3d ATC Kindergarten S., Gr.3, GCTC Ken Russell Memorial Classic, L.
Redeem the Dream (g Nadeem) Winner at 1600m, 2d ARC 3YO Salver, L, 4th Avondale Guineas, Gr.2. Race Record: 14 Starts 11-2-1 A$4,536,650. Leading 3YO Male on the 2013 WTR (Sprint). Champion 2YO in Australia in 2011-12. LONHRO Horse of the Year in Australia in 2003-04. Champion 3YO in Australia in 2001-02 & Joint top of the 2004 World Rankings (mile). Top of the 2001-02 Australasian 3YO Classification (middle). 26 wins-2 at 2-from 1100m to 2000m, A$5,790,510, AJC Queen Elizabeth S., Gr.1, VRC Australian Cup, Gr.1, LKS Mackinnon S., Gr.1, AJC George Main S., Gr.1, Chipping Norton S., Gr.1, VATC Caulfield Guineas, Gr.1, STC George Ryder S., Gr.1-twice, MRC Yalumba S., Gr.1-twice, CF Orr S., Gr.1, AJC Stan Fox S., Gr.2, Warwick S., Gr.2-twice, Royal Sovereign S., Gr.2, Hobartville S., Gr.2, Expressway S., Gr.2, Apollo S., Gr.2, MRC St George S., Gr.2, NSW Tatt's RC Chelmsford S., Gr.2-twice, VATC Blue Diamond Prelude (c&g), Gr.3, STC Missile S., Gr.3, NSW Tatt's RC Ming Dynasty H., Gr.3, STC Heritage S., L, Parramatta Leagues Club 2YO H., 2d AJC Queen Elizabeth S., Gr.1, Warwick S., Gr.2, STC Wests Illawarra 2YO H., 3d MVRC WS Cox P., Gr.1, STC Missile S., Gr.3, 4th AJC Doncaster H., Gr.1, George Main S., Gr.1, VATC Blue Diamond S., Gr.1. He entered stud in Aust. in 2004. Champion Aust. Sire in 2010-11, second in 2011-12, third in 2009-10. Leading Aust. Sire of 2YOs in 2011-12. Leading Aust. Sire of 3YOs in 2010-11. Leading Aust. Sire by Winners in 2013-14, 2014-15. Sire of 1189 progeny to race, 862 winners (72.0%), earnings of over $116 million, 83 stakes winners, 68 stakes placegetters, inc.
PIERRO (09c, Daylami, Sadler's Wells). Leading 3YO Male on the 2013 WTR (Sprint). Champion 2YO in Australia in 2011-12.11 wins-6 at 2-from 1000m to 1600m, A$4,536,650, ATC Golden Slipper S., Gr.1, Sires' Produce S., Gr.1, Champagne S., Gr.1, George Ryder S., Gr.1, Canterbury S., Gr.1, Todman S., Gr.2, Hobartville S., Gr.2, Silver Slipper S., Gr.2, MVRC Bill Stutt S., Gr.2, ATC Run to the Rose H., Gr.3, Breeders' P., L, 2d ATC Doncaster H., Gr.1, MRC Caulfield Guineas, Gr.1, 3d MVRC WS Cox P., Gr.1. IMPENDING (13c, Encosta de Lago, Canny Lad). 5 wins-1 at 2-to 1500m to 2017-18, A$2,403,989, BRC Stradbroke H., Gr.1, Kingsford-Smith Cup, Gr.1, ATC Stan Fox S., Gr.2, BRC Victory S., Gr.2, ATC Pluck at Vinery 2YO H., 2d BRC Doomben Ten Thousand S., Gr.1, ATC Sydney S., L, 3d ATC Golden Rose S., Gr.1, VRC Darley Classic, Gr.1, ATC Arrowfield 3YO Sprint S., Gr.2, Run to the Rose H., Gr.2, Star Kingdom H., Gr.3, GCTC Ken Russell Memorial Classic, Gr.3, 4th ATC Canterbury S., Gr.1, MRC Caulfield Guineas, Gr.1, BRC Kingsford-Smith Cup, Gr.1. DENMAN (06c, Vain, Marscay). 9 wins-3 at 2-to 1400m, A$1,227,875, STC Golden Rose S., Gr.1, AJC Stan Fox S., Gr.2, MRC D'Urban S., Gr.2, STC Run to the Rose H., Gr.3, MRC Zeditave S., L, Wellington Racing Club S., L, MVRC Inglis 2YO Bonus H., VRC SMS Scaffolding 2YO H., 3d VRC Western Health P., 4th VRC Australian Guineas, Gr.1. BOUNDING (10f, Exceed and Excel, Gone West). Champion Sprinter in NZ in 2013-14. Top Filly on The 2013-14 NZ 3YO Free H (1200m-1600m).8 wins-2 at 2-to 1400m, NZ$408,675, A$289,250, ARC Railway S., Gr.1, Mr Tiz Trophy, Gr.3, MRC Heath S., Gr.3, Hawkes Bay Gold Trail S., Gr.3, Waikato RC James & Annie Sarten Memorial S., Gr.3, Counties RC Murdoch Newell S., L, ARC Barfoot & Thompson 2YO S., 2d ARC Diamond S., Gr.1, New Zealand One Thousand Guineas, Gr.1, ATC Royal Sovereign S., Gr.2, VRC Gilgai S., Gr.2, Matamata Breeders' S., Gr.2, VRC GH Mumm S., Gr.3, 3d ATC Sheraco S., Gr.3. BEADED (05f, Night Shift, Bletchingly). 10 wins to 1350m, A$1,618,780, BRC Doomben Ten Thousand S., Gr.1, MRC Hyderabad Race Club S., Gr.3, BRC Sprint H., Gr.3, AJC Wenona Girl H., L, Hawkesbury RC Yalumba Cup, L, STC Big 6 Cox Plate Jackpot H., Wicked Energy H., Theraces.com.au H., Rosehill Gardens Event Centre H., 2d BRC Stradbroke H., Gr.1, Qld Tatt's RC Tattersall's Tiara, Gr.1, SAJC Robert Sangster S., Gr.1, VRC Seppelt Salinger S., Gr.2, ATC Breeders Classic, Gr.2, AJC Sapphire S., Gr.2, STC Birthday Card S., Gr.3, 3d VRC Newmarket H., Gr.1, AJC All Aged S., Gr.1, Qld Tatt's RC Winter S., Gr.1, BTC Cup, Gr.1, AJC Jim Beam H., STC Tooheys New & Brown Brothers H., 4th BRC Stradbroke H., Gr.1. MENTAL (08g, Night Shift, Biscay). Leading Older Male on the 2013 WTR (Sprint).8 wins from 1200m to 1600m, A$1,092,560, 440,400Dhs, VRC Patinack Classic, Gr.1, BRC BTC Classic, Gr.3, Meydan Al Shindagha Sprint S., Gr.3, BRC Daybreak Lover S., L, ATC Sportingbet H., Royal Randwick TV on Youtube H., 2d MVRC Manikato S., Gr.1, 3d ATC Tyreel Stud 2YO H., 4th VRC Hilton Hotels S., L.
EXOSPHERE (12c, Danzero, Marscay). 5 wins-2 at 2-to 1400m, A$1,091,600, ATC Golden Rose S., Gr.1, Roman Consul S., Gr.2, Run to the Rose H., Gr.2, Skyline S., Gr.2, 4th VRC Lightning S., Gr.1, Coolmore Stud S., Gr.1. THE CONGLOMERATE (11c, Canny Lad, Cox's Ridge). 6 wins-1 at 2-from 1300m to 2200m, R3,825,325, Greyville Durban July H., Gr.1, KRA Guineas, Gr.2, Kenilworth Politician S., Gr.3, Durbanville Thank You for Your Patronage H., Kenilworth Noordhoek Flyer H., 2d Turffontein Summer Cup, Gr.1, 3d Greyville Daily News 2000 S., Gr.1, 4th Greyville Betting World 1900, Gr.2, Cup Trial, Gr.3. KEMENTARI (14c, Redoute's Choice, Loup Sauvage). 4 wins-1 at 2-from 1200m to 1600m to 2017-18, A$1,907,350, ATC Randwick Guineas, Gr.1, Hobartville S., Gr.2, Eskimo Prince S., Gr.3, Seven News 2YO P., 2d MRC Caulfield Guineas, Gr.1, Memsie S., Gr.1, CF Orr S., Gr.1, ATC Missile S., Gr.2, Rubick at Coolmore 2YO P., 3d ATC George Ryder S., Gr.1, MVRC Manikato S., Gr.1, MRC Caulfield Guineas Prelude, Gr.3, 4th VRC Makybe Diva S., Gr.1, ATC Winx S., Gr.1, Run to the Rose H., Gr.2. LYRE (16f, Street Cry, Encosta de Lago). 3 wins at 2 in 2018-19, A$1,381,400, MRC Blue Diamond S., Gr.1, Blue Diamond Prelude (f), Gr.2, 3d ATC Golden Slipper S., Gr.1. BENFICA (08c, Danehill, Star Way). 3 wins at 2, A$467,150, BRC TJ Smith S., Gr.1, Hampden S., L, STC Blackwoods 2YO H., 2d AJC Corporate Membership 2YO H.
ARISTIA (15f, Tiger Hill, Marwina). 2 wins at 2000m, 2500m in 2018-19, A$958,200, VRC Oaks, Gr.1, VRC Wakeful S., Gr.2, 2d SAJC National S., Gr.3, MRC Ethereal S., Gr.3, 3d ATC Vinery Stud S., Gr.1, Phar Lap S., Gr.2, VRC Frances Tressady S., Gr.3, MVRC 1print H., CRT & Whites Rural 2YO P.
PINWHEEL (05g, Danehill, Bletchingly). 12 wins to 1400m, A$1,230,875, ATC Warwick S., Gr.2-twice, Missile S., Gr.3, Qld Tatt's RC WJ Healy S., Gr.3, STC Canterbury Classic, L, Clarence River JC Ramornie H., L, MRC Jellis Craig Pink Ribbon Cup, Hawkesbury RC NCP Printing Sweepstakes H., AJC Orange Grove H., STC TAB Number 1 Club H., Rosehill Event Centre H., Hyland Race Colours H., 2d MVRC Australia S., Gr.2, ATC Southern Cross S., Gr.3, Qld Tatt's RC WJ Healy S., Gr.3, AJC Show County H., L, ATC Hall Mark S., L, STC Canterbury Classic, L, AJC Randwick's 150th Anniversary H., Blackwoods H., Catalan Opening H., STC Grand Pavilion H., 3d MRC Futurity S., Gr.1, SAJC Goodwood H., Gr.1, ATC Missile S., Gr.3, MRC Betfair S., Gr.3, SAJC DC McKay S., Gr.3, 4th BRC Stradbroke H., Gr.1, WATC Winterbottom S., Gr.1, ATC Premiere S., Gr.2, Expressway S., Gr.2, Theo Marks H., Gr.2, Liverpool City Cup, Gr.3-twice, Sebring S., Gr.3. MESSENE (08g, Redoute's Choice, Kenmare). 10 wins from 1250m to 2000m, A$970,773, ATC Ajax S., Gr.2, Murrumbidgee TC Wagga Wagga Gold Cup, L, Canberra RC National Sprint H., L, ATC December H., Thoroughbred Breeders NSW H., Become an ATC Sponsor H., Anzac Day H., Canterbury Park H., Tab.com.au H., MRC TMB Printing P., 2d WATC Railway S., Gr.1, ATC Missile S., Gr.2, Sky High S., Gr.3, Neville Sellwood S., Gr.3, MRC Settlement at Cranbourne H., 3d ATC Warwick S., Gr.2, Shannon S., Gr.2, 4th ATC Epsom H., Gr.1, Show County H., Gr.3. HEATHERLY (12f, Danzero, Centaine). 6 wins-1 at 2-at 1000m, 1100m, A$655,050, MRC Rubiton S., Gr.2, VRC Bob Hoysted H., L, MVRC Carlyon S., L, VRC Andrew Guy P., MVRC Slickpix H., Fujitsu 2YO P., 2d MVRC AJ Moir S., Gr.1, Ian McEwen S., Gr.2, VRC Festival of Racing S., L, MVRC Carlyon S., L, MRC Total Logistic Solutions H., 3d MRC Oakleigh P., Gr.1, MVRC Ian McEwen S., Gr.2, Jeep 55 Second Challenge Heat 9 H.
WAWAIL (11f, Redoute's Choice, Sunday Silence). 6 wins-1 at 2-to 1400m, A$488,550, VRC AV Kewney S., Gr.2, Frances Tressady S., Gr.3, MRC Twilight Glow S., L, VRC Pack a Picnic P., MRC Beveridge Williams 2YO P., MVRC Quest H., 2d VRC Hong Kong Jockey Club S., Gr.3, MRC Cape Grim Beef Steaks Series Final, Gr.3, 3d VRC Vanity S., Gr.3, MRC Geoffrey Bellmaine S., Gr.3, MVRC Alexandra S., L.
ACADEMUS (09g, Dehere, Old Vic). 4 wins at 1200m, 1600m, A$593,800, Western Australian Guineas, Gr.2, Gold Coast Guineas, Gr.3, BRC Daybreak Lover S., L, 2d BRC Sires' Produce S., Gr.2, Champagne Classic, Gr.2, MRC Heading Out Hair & Beauty S., L, Hawkesbury RC Inglis Bonus 2YO H., 3d BRC TJ Smith S., Gr.1, BTC Classic, Gr.3, 4th BRC Queensland Guineas, Gr.2, VRC Hilton Hotels S., L.
CARDSHARP (15g, Danehill, Southern Halo). 6 wins-4 at 2-to 7f to 2019, £247,081, Newmarket July S., Gr.2, Salisbury Cathedral S., L, Epsom Woodcote S., Lingfield Like Sun Racing on Facebook H., Beverley Brian Yeardley Continental 2YO Trophy, 3d Newmarket Middle Park S., Gr.1, York Gimcrack S., Gr.2, Goodwood Richmond S., Gr.2, Royal Ascot Norfolk S., Gr.2, Goodwood Supreme S., Gr.3, Wolverhampton Lady Wulfruna S., L, Kempton 32red/British Stallion Studs EBF Conditions S.
HOLDING GOLD (13g, Golden Missile, Groovy). 5 wins-1 at 2-at 5f, 5½f to 2018, US$489,552, Keeneland Shakertown S., Gr.2, Saratoga Quick Call S., L, Fair Grounds Colonel Power S., L, 2d Woodbine Kennedy Road S., Gr.2, Saratoga Troy H., L, Presque Isle Downs Tom Ridge S., L, 3d Woodbine Highlander S., Gr.1, Belmont Jaipur S., Gr.3, 4th Belmont Jaipur S., Gr.2, Woodbine Play the King S., Gr.2. WAR HEROINE (15f, War Chant, Tejano). 4 wins-1 at 2-at 6½f, 1m to 2018, US$240,945, Del Mar San Clemente S., Gr.2, Santa Anita Sweet Life S., L.
GHISONI (12f, Red Ransom, Polish Precedent). 4 wins to 1400m, A$401,325, ATC Surround S., Gr.2, BRC Glenlogan Park S., Gr.3, ATC Watagan Grange H., TAB Rewards P., 2d Hawkesbury RC Godolphin Crown, Gr.3, Geelong RC Rosemont Stud S., L, 3d Scone RC Dark Jewel Classic, Gr.3. LONHSPRESSO (09f, Grand Lodge, Best Western). 4 wins at 1200m, A$324,775, SAJC Centrebet Classic, Gr.2, VRC Straight Six H., L, MRC Land Engineering H., 2d Swan Hill JC Golden Topaz, 3d MRC Alinghi S., L.
SOUCHEZ (13g, Redoute's Choice, General Nediym). 3 wins-2 at 2-to 1400m, A$385,970, ATC Pago Pago S., Gr.2, VRC Hilton S, L, ATC Schweppes 2YO P., 3d ATC Skyline S., Gr.2, BRC Champagne Classic, Gr.2, 4th BRC JJ Atkins S., Gr.1. ISOTHERM (13c, More Than Ready, Sea Hero). 3 wins-2 at 2-at 8½f, 1¼m, US$510,259, Santa Anita San Marcos S., Gr.2, Belmont Pilgrim S., Gr.3, 2d Laurel Commonwealth Derby, Gr.2, Gulfstream Park Dania Beach S., Gr.3, Del Mar Harry F Brubaker S., L, 3d Santa Anita Awesome Again S., Gr.1, Saratoga Saranac S., Gr.3, Santa Anita San Simeon S., Gr.3, Del Mar Native Diver S., Gr.3, 4th Santa Anita Mathis Brothers Mile S., Gr.2. OBSEQUIOUS (07f, Commands, Quest for Fame). 3 wins-1 at 2-to 1200m, A$394,700, ATC Light Fingers S., Gr.2, AJC San Domenico S., Gr.3, Lansdowne 2YO H., 2d AJC Roman Consul S., Gr.2, STC Reisling S., Gr.2, MVRC Typhoon Tracy S., L.
PARABLES (07f, Night Shift, Imperial Prince). 3 wins-1 at 2-at 1200m, 1400m, A$425,400, ATC Surround S., Gr.2, AJC Silver Shadow S., Gr.3, Cabramatta 2YO H., 2d STC Tea Rose S., Gr.2, MRC WW Cockram S., Gr.3, 3d AJC Flight S., Gr.1, ATC Light Fingers S., Gr.2, VRC Let's Elope S., Gr.2, NSW Tatt's RC Furious S., Gr.2, VRC MSS Security Sprint H., L, AJC Keith Mackay H., L, 4th ATC Sapphire S., Gr.2. ENCRYPTION (15c, Exceed and Excel, Elusive Quality). 2 wins-1 at 2-at 1200m to 2018-19, A$717,100, VRC Danehill S., Gr.2, Canberra RC Black Opal S., Gr.3, 2d MRC Oakleigh P., Gr.1, VRC Maribyrnong P., Gr.3, MRC Blue Sapphire S., Gr.3, Chairman's S., Gr.3, 3d MRC WJ Adams S., L, Debutant S., L, 4th ATC Galaxy H., Gr.1, Arrowfield 3YO Sprint S., Gr.2. RENAISSANCE (05f, Canny Lad, Danehill). 6 wins to 1400m, A$234,630, AJC Sapphire S., Gr.2, St Johns Park H., STC Canterbury Event Centre H., Freeway Hotel Artarmon H., 7 Steel Buildings Solutions H., 2d Hawkesbury RC Darley Crown, L.
SESSIONS (09c, Canny Lad, Danehill). 5 wins-1 at 2-to 1200m, A$551,950, ATC Shorts H., Gr.2, Onemorenomore First Crop H., N&A Fruit Distributors H., CFMEU Mining & Energy H., RAAF H., 2d ATC Concorde S., Gr.3, Tab.com.au H., 3d MVRC Manikato S., Gr.1, ATC Hollywood Fashion Secrets H., 4th ATC Galaxy H., Gr.1, VRC Gilgai S., Gr.2, ATC Shorts H., Gr.2. BANISH (14f, Bernardini, Canny Lad). 4 wins-1 at 2-from 1200m to 1600m to 2017-18, A$211,700, Moonee Valley Fillies Classic, Gr.2, 2d ATC Newgate Sizzling 2YO H., 3d MRC Aquis Farm Supports Pinchapoo P., Wellington RC 2YO H.
OLD NORTH (12g, Elusive Quality, Danehill). 4 wins from 1350m to 2000m to 2017-18, A$316,990, ATC Tulloch S., Gr.2, BRC Makers Mark H., ATC All Too Hard at Vinery P., Cafe Culture & Insitu H., 2d ATC Frank Packer P., Gr.3, 3d ATC Octagonal H., NSW Tatt's RC National Jockeys Trust H., 4th ATC Shannon S., Gr.2, Phar Lap S., Gr.2, GCTC AD Hollindale S., Gr.2. O'LONHRO (05c, Zoffany, Cardinal). 3 wins from 1250m to 1600m, A$222,650, AJC Chelmsford S., Gr.2, STC Rabbitohs to 8000 Members H., Madura Pure Assam Tea H., 2d AJC Warwick S., Gr.2, STC Rosehill Gardens Event Centre H.
GENERALIFE (09g, Redoute's Choice, Keltrice). 9 wins-1 at 2-to 1400m, A$873,595, ATC Star Kingdom S., Gr.3, Civic S., L, Winter S., L, Gaypak United Fruit H., Patinack Farm Supporting 4tracks4kids H., MRC Sportingbet H., Hawkesbury RC Westaflex H., 2d MRC Kevin Heffernan S., Gr.3-twice, ATC Big Sports Breakfast H., 3d BRC Stradbroke H., Gr.1, Doomben Ten Thousand S., Gr.1, VRC Yellowglen S., Gr.3, MRC Moonga S., Gr.3, ATC Harvey Norman H., Hyland Race Colours H., MVRC City Jeep H., 4th VRC Gilgai S., Gr.2, ATC Premiere S., Gr.2, Liverpool City Cup, Gr.3, Southern Cross S., Gr.3, Festival S., L.
SKYTRAIN (05g, Luskin Star, Todman). 9 wins-1 at 2-to 1300m, A$707,300, ATC Southern Cross H., Gr.3, Canterbury Classic, L, Show County H., L, AJC Stargazer 2YO H., ATC Ingham Chicken & Turkey H., STC Ranvet H., Denman Hotel Thredbo H., Marshall Motors H., Whites Wires H., 2d ATC Expressway S., Gr.2, Hall Mark S., L, At Sea H., Westend Mazda H., STC PJ Gallagher's Irish Pub H., Hutchinsons Builders H., Top Cut Steaks H., 3d ATC June S., L, Carrington S., L, STC Jacob's Creek Moscato H., ATC Canterbury BMW Financial Services H., AJC Professor Chris O'Brien AO H., 4th ATC Starlight H., L, Gosford RC Takeover Target S., L, Scone Quality H., L.
RASPBERRIES (07f, Grand Lodge, Sovereign Red). 7 wins from 1400m to 1600m, A$537,050, VRC PFD Food Services S., Gr.3, Newcastle JC Cameron H., Gr.3, Scone Cup, L, ATC Rydges Cronulla H., Comfort Inn Hunts Liverpool H., Bowermans Supports the ATC H., 2d ATC Adrian Knox S., Gr.3, Tamarama H., STC Canterbury Park H., 3d MVRC Sunline S., Gr.2, ATC Doncaster Mile Prelude, Gr.3, MRC Sandown S., Gr.3, 4th VRC Blazer S., Gr.2, MVRC Tesio S., Gr.3, Newcastle JC Newmarket H., Gr.3. SHAKHIMAT (13g, Touch Gold, Dynaformer). 5 wins-2 at 2-from 7f to 9f, US$444,096, Keeneland Transylvania S., Gr.3, Gulfstream Park Tropical Turf S., Gr.3, Woodbine Coronation Futurity, L, 2d Woodbine King Edward S., Gr.2, Plate Trial S., L, 3d Woodbine Cup & Saucer S., L, Labeeb S., L.
SWEYNESSE (11c, Singspiel, Nashwan). 4 wins-1 at 2-from 1400m to 1800m, A$612,900, ATC Gloaming S., Gr.3, Newcastle JC Spring S., Gr.3, ATC TAB Early Quaddie H., 2d ATC Randwick Guineas, Gr.1, Hobartville S., Gr.2, 3d ATC Spring Champion S., Gr.1, 4th ATC Rosehill Guineas, Gr.1. CELTS (07f, Canny Lad, Alert). 4 wins at 1100m, 1200m, A$337,835, ATC Birthday Card S., Gr.3, City Tatt's RC Governor Macquarie Cup, L, MVRC Mitchelton Wines Premium H., AJC Sadleir P., 2d ATC Fireball H., L, Eskimo Prince S., L, MRC Sportingbet Sprint Series Final S., L, STC Schweppes Sparkling Mineral Water 2YO H., 3d STC Magic Night S., Gr.2, Gosford Guineas, L, 4th ATC Sheraco S., L.
TRIM (06f, Night Shift, Water Mill). 3 wins-1 at 2-at 1200m, A$336,450, STC Research S., Gr.3, VRC Red Roses S., L, STC Autumn Racing 2YO H., 2d AJC Light Fingers S., Gr.2, BTC Champagne Classic, Gr.2, GCTC Ken Russell Memorial Classic, L, VRC MSS Security Sprint H., 3d ATC Wenona Girl H., L, 4th VRC AV Kewney S., Gr.2. RANIER (15c, Commands, Grand Lodge). 2 wins at 1400m, 1600m in 2018-19, A$285,720, VRC Carbine Club S., Gr.3, MRC Gothic S., L, 2d VRC Maribyrnong Trial S., L, Poseidon S., L, ATC ANZ Bloodstock News H., Tab.com.au H., 3d NSW Tatt's RC Heritage Society H., 4th VRC CS Hayes S., Gr.3. BEIRUT (10f, Hennessy, Zeditave). 8 wins at 1200m, A$270,900, SAJC Spring S., Gr.3, MRC Mypunter.com H., Le Pine Funerals H., Cove Hotel H., 2d MRC Sportius Global Events H., 3d MRC Hardings Hardware H.
WONDER KID - JOLLY BANNER (H.K.) (11g, Jade Robbery, Riverman). 7 wins to 1400m to 2018-19, A$22,000, HK$10,485,200, HKJC Bauhinia Sprint Trophy H., Gr.3, Kwangtung Cup, MRC (Mornington) Toronado at Swettenham P., HKJC La Colline H., Chevalier Senior Housing H., Tin Shui Wai H., Hopeful Future for Youth H., 2d HKJC Chinese New Year Cup, Lion City H., Beas River H., HKU JC Student Villages H., 3d HKJC Oriental Watch Sha Tin Trophy, Gr.2, Flamingo Flower H., Sha Tin Mile Trophy H., Kwangtung Cup, Tolo Harbour H., Precision H., Hoi Yuen H., Sai Van Bridge H., Entrapment H., 4th HKJC Premier Cup, Gr.3. SCREEN (06f, Zeditave, Kaoru Star). 7 wins to 1400m, A$386,503, ATC Golden Pendant, Gr.3, AJC Sydney Carnival on Sale H., Corporate Membership H., ATC Trippas White Group H., MVRC Pulse Pharmacy H., MRC Sufficient H., 2d Hawkesbury RC Darley Crown, L, STC Rosehilll Gardens Event Centre H.
MECIR (08g, Al Akbar, Grosvenor). 5 wins to 1400m, A$263,190, Newcastle JC Newmarket H., Gr.3, ATC Blackwoods Loctite H., Schweppes H., Styletread.com.au P., Lawler Partners Sprint H., 2d ATC Membership on Sale Now H., 3d ATC Tab.com.au H., 4th MRC Victoria H., Gr.3. DEER VALLEY (06f, Danehill, Seattle Slew). 5 wins-2 at 2-to 1200m, A$251,525, AJC Silver Shadow S., Gr.3, BRC Coke Zero H., Santos Tour Down Under H., AJC Queen's Park 2YO H., 2d BRC Dr John Power H., L, AJC McGovern Pope H., 3d STC Tea Rose S., Gr.2, 4th BRC Queensland Guineas, Gr.2. ALFOLK (14g, Exceed and Excel, Straight Strike). 4 wins-2 at 2-at 1000m, 1150m to 2017-18, R445,500, 10,000Dhs, Turffontein Lebelo Sprint, Gr.3, Play Soccer 6 10 & 13 Graduation P., Flamingo Park Raceday in August Juvenile P., 2d Turffontein Storm Bird S., L, Golden Loom H., L, Racing Association Juvenile P., 3d Vaal IFM 102.2 Heritage 1200. NOOTKA SOUND (15f, Empire Maker, Clever Trick). 3 wins-1 at 2-to 7½f to 2018, Belmont Soaring Softly S., Gr.3, 2d Aqueduct Bridgetown S., L.
PIN SEC (16f, Commands, Strategic). 2 wins at 2 in 2018-19, A$241,850, Canberra RC Black Opal S., Gr.3, ATC Theraces 2YO H.
DEMERIT (06c, Scenic, Spectacular Bid). 2 wins at 1200m, 1400m, A$260,400, MRC Caulfield Guineas Prelude, Gr.3, 2d VRC AAMI Business Insurance S., Gr.3, MRC Sandown S., Gr.3, Blue Sapphire S., L, 3d STC Canterbury S., Gr.2-twice, 4th AJC Shorts H., Gr.2, MRC Moonga S., Gr.3. AMERCEMENT (16f, Commands, Royal Academy). Winner at 2 in 2018-19, A$106,500, ATC Widden S., Gr.3, 4th ATC Magic Night S., Gr.3, Gimcrack S., Gr.3. EIGHT TILL LATE (08f, Redoute's Choice, Grosvenor). Winner at 1600m, A$132,280, WATC Champion Fillies S., Gr.3. His sire sons include Pierro (16), Denman (15), Demerit, Benfica, O'Lonhro, etc. First yearlings sold for $1,500,000, $1,400,000 etc. The first crop sire sensation of 2014!